Wheel Creations PVD is a proud provider of show quality PVD chrome wheels and other custom finishes. Our O.E.M.- approved PVD chrome process is the ultimate modern chroming method for factory finish and aftermarket wheels. Since 1985, we have served car owners, independent tire dealers, aftermarket auto specialty shops, and auto dealerships. As an industry-leading provider of PVD chrome rims in California, you can trust us for professional and reliable services. Unlike the traditional chrome wheel plating that peels and pits with normal wear and tear, Physical Vapor Deposition (PVD) chrome is a highly durable finishing process that lasts much longer than chrome plating. We exclusively use this for our wheels. At Wheel Creations, we provide our clients with a variety of PVD chrome wheel finishes for their wheels. Our offerings include PVD bright chrome, PVD black chrome, PVD onyx chrome and other specialty colors. PVD chrome has long been used in the aerospace industry and is now a popular finish in the automotive industry. Our O.E.M. PVD chrome plating process is 100% environmentally friendly, and ensures years of service for your PVD rims even in the harshest weather conditions. PVD chrome wheels are also 80% lighter than traditional chrome plated wheels, which leads to better fuel economy. To ensure maximum durability, we use our proven, specialized powder-coated primer on wheels, apply a mixture of chrome in a PVD vacuum chamber, and an acrylic clear coat to protect the wheels. What you get is a PVD chrome finish that’s perfect for any weather conditions. 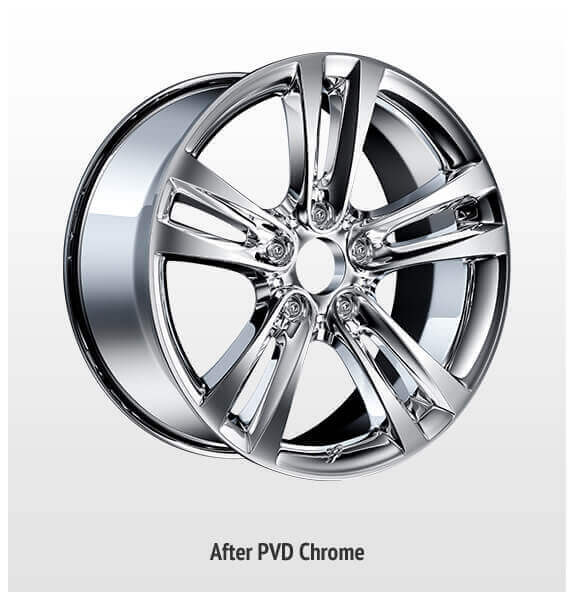 With PVD chrome, you don’t have to worry about curb rash, peeling, corrosion, or pitting of your wheels. Our chrome finishes protect your wheels against these possibilities, and in case your PVD chrome wheels need repairs, they can be reworked easily and affordably. Our chrome finishing far outlasts your factory finish with up to a 4+ year warranty. We also offer wheel refinishing and restoration services that give your wheels a new and beautiful look. 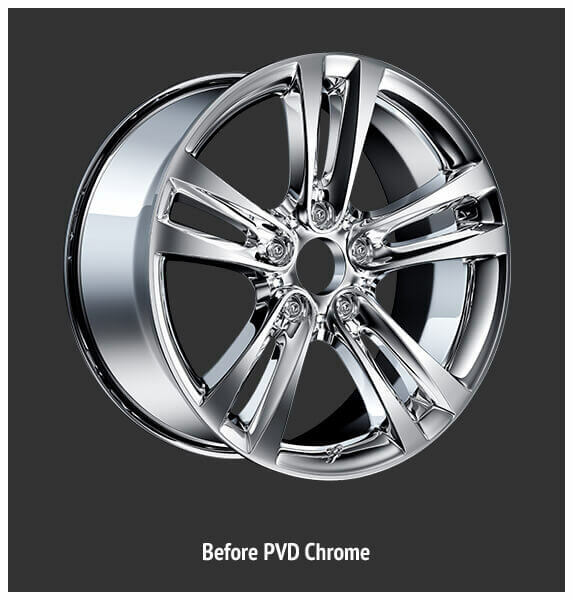 With PVD chrome, you don’t have to worry about curb rash, peeling, corrosion, or wheel pitting. Our chrome finishes protect your wheels against these possibilities, and in case your PVD chrome wheels need repair, they can be reworked easily and affordably. Our chrome finishing far outlasts your factory finish with up to a 4+ year warranty. We also offer wheel refinishing and restoration services that give your wheels a new and beautiful look. "It was a pleasure working with Lauren and her team. I have never done an upgrade on any of my vehicles before but wanted to jazz up my 2014 Camry. Lauren walked me through the whole process, sent me photos along the way and helped me upgrade my vehicle not only with a new wheel style but also a black chrome finish. The wheels arrived at my doorstep, I took them to my tire guy to have them mounted. It was simple. I would definitely use Wheel Creations again." "Thank you, Lauren, for answering my email about Black Chroming my OEM 2012 Chevrolet ZL1. I was just getting ready to pull the trigger on a set of Black Chrome wheels from another vendor when you contacted me and explained the differences and sent me pictures of the different shades and that was exactly what I needed. You also went above and beyond having just had a newborn and was very patient with me. For all this, I say thank you and would highly recommend you to anyone wanting exceptional work and fast turnaround. " "I have had two sets of wheels coated for me by Wheel Creations PVD. They provide a top quality product at very competitive prices. 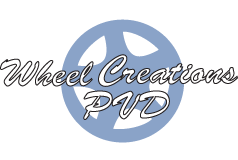 In my opinion, what is more important, is the high level of service I get from Wheel Creations PVD. Lauren & Co. treat every customer like family, and they will truly do whatever it takes to make sure you are satisfied. 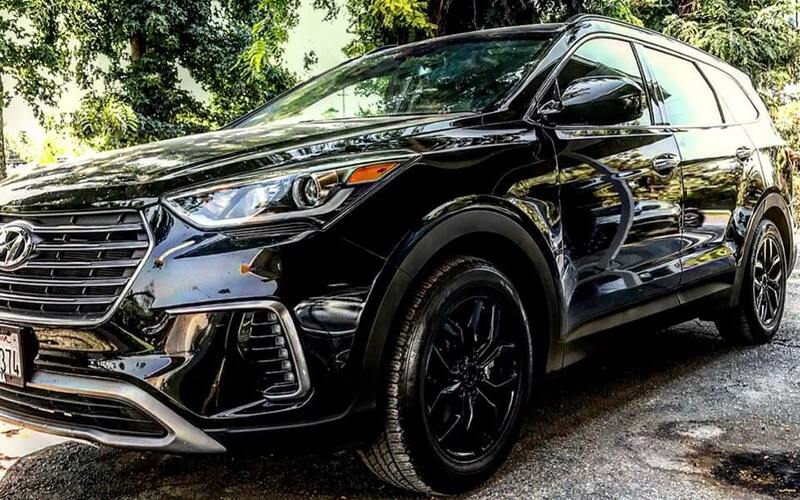 Every new car I get moving forward will have Wheel Creations PVD coated wheels, and I highly recommend you take your chrome and powder coating projects to them." Upgrade your wheels with our O.E.M chrome wheel exchange program. In business for more than 12 years, we know what our customers want. That’s why we provide an industry-leading wheel exchange program that enables both car owners and dealerships to enjoy the benefits of custom PVD chrome finishing. Our O.E.M. wheel exchange program allows you to buy a new set of wheels for your car affordably by sending your old wheels back to us. The exchange program provides a convenient and easy way to replace your factory finish or aftermarket wheels instead of getting an outright purchase. Our wheel exchange program requires a “refundable” core charge that is usually paid up front as a deposit at the time of purchase. Once we receive your wheels, we refund your deposit. A full refund is only offered if the core wheels are in good condition. Damaged wheels may be subject to repair charges that may range between $20 to $40 per damaged wheel. We only exchange same-style O.E.M. wheels. We sell PVD wheels or PVD chrome rims in an exchange program. Clients simply pick out their preferred wheel type for their vehicle make and model, receive the chrome-finished wheel at their preferred shipping address, and then send back their non-chrome factory finish wheels to us. We provide PVD chrome plated rims to car dealerships in exchange for non-chrome wheels so they can sell them to their customers as an up-sell when they purchase a car. Once you place your order, a WCPVD sales representative is assigned to your wheels. This rep will track your wheels from the moment they leave your location to arriving at our facility. Once in process your sales rep will ensure that you receive the best possible quality, make sure that all attention to detail is met and then return your wheels back to you in a timely fashion. Quality is important to us. That is why at WCPVD we are continuously perfecting our techniques to deliver the best possible quality on the market. Our painters aren't mechanical (unlike our competition) they are real life human beings that care about the quality of work they produce. At WCPVD we understand how exciting it is to style your vehicle and how difficult it is to wait for results. With that in mind, our production team goes the extra step to ensure you know where your wheels are and how they are doing. Before shipping we will send you a photo of our finished work, that way you know what your getting and the excitement can grow as you patiently await shipping back to you! Are you ready to send us your wheels? Give us a call at (562) 381-2670 or send us an email and we will send you the shipping labels and paperwork to get started on styling your vehicle! Our O.E.M. wheel exchange program is designed to help you get the perfect set of wheels. Want to order a new set of PVD chrome finished wheels? Upgrade your wheels at Wheel Creations today.